Chanel Demaquillant Yeux Intense Biphase Eyemakeup Remover - Dual-phase formula gently whisks away all eye makeup, even waterproof mascara. Provides effective eye makeup removal with the refreshing feel of water. Suitable for sensitive eyes and contact lens wearers. Water Cornflower Extract and Water Rose Extract soothe and calm vulnerable eye area. I have been using Chanel's biphase eyemakeup remover for a while now, and hence the review today. The only other "makeup remover" I have used is olive or coconut oil, and so this review is going to be very short, and no comparisons with other makeup removers. Biphase makeup removers consist of two phases, an oil phase and a water phase, one floating over the other, and you have to shake the bottle to mix the two before use. Left standing undisturbed, the phases will very promptly return back to their separated states. Shake bottle; lightly moisten cotton pad. Apply pad to eyelid and lashes and leave for a few seconds, then wipe off eye makeup. Rinse well. A few drops on a cotton square takes off ALL my eye makeup, one side. I then turn the cotton square and use the unused side on my other eye. 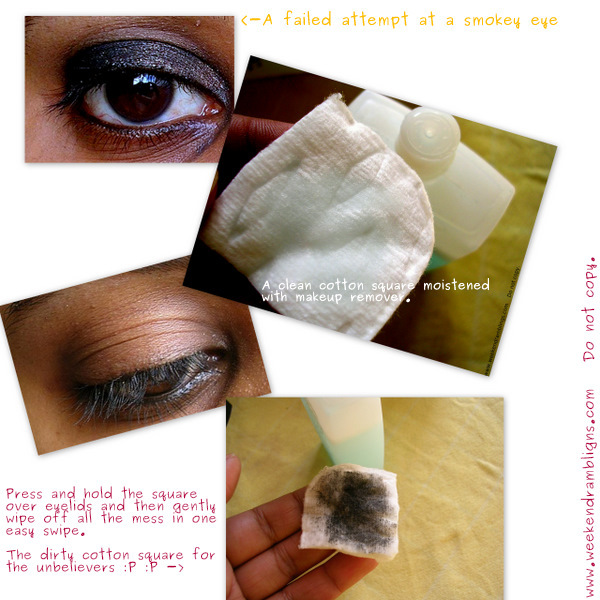 Yup, I don't mind using more eyemakeup remover, but I would hate to waste cotton! I then take a Q-tip, wet it with the remover, and then use it to take off any kajal from the waterline. That's it. Fuss-free, quick, and absolutely nonirritating for my eyes. I love it. Rinse eyes after this - something I have skipped many times. In case you don't get the time to wash your eyes right away - there is not much oily residue left, and it just disappears after a while, soaking into the skin I suppose. Or you could dab dab with a paper tissue, and there you have it - nekkid clean eyes. It is a fabulous makeup remover. Is it the best in the market, I wouldn't know because I have not tried any other. A Chanel product, so it comes with a very ouch price tag of Rs. 1650/100 mL. Would I buy it again? I am a long way from finishing this bottle, and I would probably buy this again unless something I see something better (highly unlikely I would try anything else). Chanel Demaquillant Yeux Intense Biphase Eyemakeup Remover (available here) - Cost: $32/3.4 fl. oz. Complete list of Chanel product reviews (here). No..I like what you write, your dry sense of humor (except when you use the wet and stinky but that's not here..)..
Hey, I was walking through your blog (so far April 2010 from whereon you went prolific). Long time no book rambling??? Talk about books too..
ok...let me start from the beginning...did not iron my clothes...just wore a denim and top,but told my hubby u shd be decently dressed else they will not give any bhav (he is a v v casual dresser) :D. Hv been wanting to buy a solitaire for long and bec my bday is due...it was the right time...entered and were duly assigned to a lady assistant who took us through all the collection...didnt like any...half way i could see that she was getting frustrated...no coffee ..no nimbu panni yet...i miss the mallu stores...then i insisted on taking me to solitaire floor and she was a bit reluctant...thought we were there for timepass....took...we saw few..and finally i selected a 40cents wala earring !!! and the coffee finally was asked :-D...but me happy..they know their job and the stones are beautiful :D...that def made a dent into the wallet..but wht the heck..he only has one wife :D and one daugh who anyway only likes gold !! 40 :D :D :D :D Oh wowww..me get this feeling you happy glowing more than the solitaire..they have separate floor for those??? Oh wowowww.....thats the Tolkowsky (unsure spelling) collection?? Me so wowwwww at you..Oh was that girl Ketsia? She was the SA when my mom went..and ya they do know their job really well. My dad..the second time we went, he asked if he could have some coffee...my mom and I we just stared at him..He is usually the quiet kind, but he found KC so good and he loves the place..he felt comfortable enough to ask them for coffee....I died and my mom died too! When is your birthday, though? Oh you welcommmme..I searched for Kanya the other day..didn't find it..perhaps I should do the sensible thing and call them up instead. tk the no...25267446.. am due for my haircut...will mostly do it this weekend..u wanna join? okay sensible question..how is it diff from lancome bi facial..or watever? Pls call them..heheheee..we no tell you what KC is or what Kanya is heheheheheee. er.....because the golden glitter flies...oh i will try it now and see. KC - Krishniah Chetty. She bought her first first first solitair from there finallllly. And preeeeeeeeeeeeen preeeeeeeeeeeeen...me recommended the place preeeeeeeeeeeen. Kanyaa - she gets her haircuts there. Claims can make me look hooman. oh eh he he ...you you get a ahaircut. I am also planning to get one this month..
Somebody is talking about Kanya...That is the only ever place I go to for facials, haircut etc etc..They do a lovely job. U know Rads...I have done my first waxing ever as a teenager there...and from then, there was no looking back. lol..I am copy pasting everything on notepad..and then reading it!! ...Heights of insanity!!!! duuuuuuuuuuh!! I think something is wrong with my browser!!!!!!!!!!!!! Its been a while since its in transition but you didn't have a problem yesterday or the day before so I am not really sure what the problem is. No wonder she paid Rs. 1850 for a makeup remover....this one has "HYDROGENATED CASTOR OIL" as one of the key ingredients...............its multipurpose for Hidimbi.....yeah...is anyone else listening?????? Good morning :) Is still getting sorted I think Poornima..
rads whats the camera u use?